I’ve always been a bit of a tech junkie. If I wasn’t afraid of revealing my age, I could tell some pretty good stories. To me, technology is exciting and invigorating, but also something to be respected. Technology at any level can run amok – think about Lucy in the chocolate factory as a basic example of what can go wrong. And who wants the artificial intelligence to run amok like HAL 9000? Having lived in an electronic practice for nearly a decade and having used computers in the hospital for almost a decade before that, I can say with a good level of confidence that it’s not always the technology that’s at issue. Systems are only as good as the users who operate them, in conjunction with the training they receive and the proficiency they demonstrate. A recent situation at UC Irvine Medical Center illustrates this. The hospital deployed new infusion pumps without hospital-wide training. No policy and procedure document was developed (let alone approved) for the safe use of the new pumps. 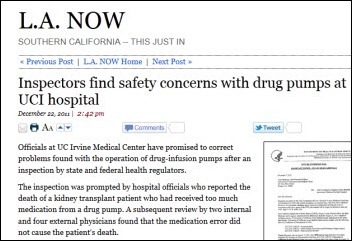 The hospital was “unable to ensure that MD… was competent in accurately programming the medication infusion pump.” The pump didn’t have a drug library and was programmed with a dose over 30 times that of the prescribed dose. Only allowing trained RNs who have documented competency to program the pumps. Ensuring that dose, concentration, and flow rates are chosen from a current drug library appropriate to the care area. Restricting the ability for users to enter dose/rate for non-library medications unless a second user verifies the programming. Requiring re-verification of orders and programming when soft limits are overridden. Instituting hard stops which cannot be overridden for certain medication doses. These seem like no-brainer fixes to me. I’m glad the hospital put policies in place that should have been there all along (regardless of the newness of the brand of pump, model, etc., these are just good patient safety procedures). The document goes on to list several other fairly horrifying behaviors, including a director of pharmacy who admitted knowing that no policies were in place and that no one was overseeing pump safety. “We will in the future, but the pharmacy department needs to be trained first.” He/she also stated that the vendor provided inadequate training for monitoring of pump-related events. Blaming the vendor is always easy – it takes a steadfast leader to halt a go-live when adequate training has not yet taken place. Residents examining patients but not writing progress notes (even after a nursing supervisor notified the attending physician) on several occasions. An oncology staff nurse (whose job duties included validating chemotherapy doses) who was unable to calculate the dose when given a patient’s weight in pounds and a dose in milligrams per kilogram. I had to quit reading after a while because I’m extremely compulsive about patient safety and it was just making me increasingly agitated. Despite the potential harm involved in the pump-related incidents, I’m actually glad they happened. Why? Because the incidents acted as a trigger to expose some significant issues and deficits in patient safety. Patient safety is a culture that requires education and support. It doesn’t happen in a vacuum. I wouldn’t let an adolescent operate a lawn mower independently without appropriate training, safety gear, and close supervision. We don’t allow teenagers to drive cars (aka operate deadly weapons) without proving a minimum level of proficiency. Yet in this situation, users were allowed to operate equally dangerous machinery without training. The documentation doesn’t mention whether the nurses were forced to operate the pumps over their objections, but the point is they shouldn’t have been asked to use potentially lethal equipment they weren’t qualified (by training and demonstrated competency) to use. I hope this case serves as a wake-up call for some institutions. I hope end users continue to speak up when they’re asked to do things that are unsafe and that someone listens. Lives depend on it. Patient Safety (and related infrastructure to support/improve this ) is certainly marginalized by the business-oriented mindset within our Health “industry”. This is partly due to the (incorrect) belief that due to its preventive nature, it does not directly tie into product features as long as the minimal requirements are met. In many device design sessions, safety protection is a variable that the company decides not to maximize, for a variety of business reasons. Other factors like alarm fatigue, “MD halo” (active relucatnce to confront a physician) also come into play. There’s also a cultural aspect to this – and, insurance models not withstanding, most patients are not likely to be aware of non-obvious risks and not likely to seek damages unless something dramatic/traumatic takes place. Even NIH and FDA have repeatedly overlooked many opportunities to improve safety. Having had much experience in this arena, it seems to me that we need to log not just safety related disasters but also candidly record all near misses; Some of this already takes place and still can be improved substantially.